It's finally here! 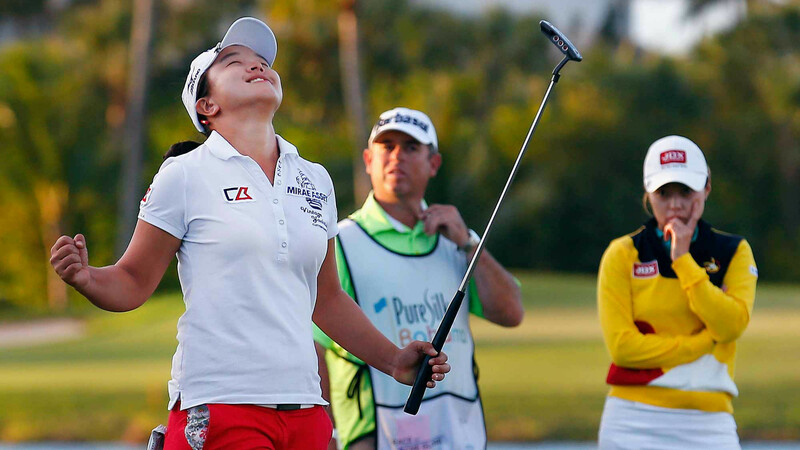 The new LPGA season starts this week at the Pure Silk Bahamas LPGA Classic. This was the event where Americans learned to respect the name Sei Young Kim, who got the first of her three LPGA wins as a rookie at the appropriately-named (for her, anyway) Paradise Island. Sei Young said her goal in coming to America was to make the Korean Olympic team -- a real challenge, given the number of Koreans in the Top15 of the Rolex Rankings -- but she's well on her way. Currently #7 in the world, she's third on the Olympic list behind Inbee Park and So Yeon Ryu, but several more Koreans are right on her heels. A title defense would go a long way towards putting her on the team. Although Lydia Ko isn't in the field this week -- she starts her season next week in Florida -- the list of high-ranking players in the Bahamas is pretty well stacked. According to Tony Jesselli in his preview, 30 of the Top50 in the Rolex will tee it up. Good news for Sei Young, as several of the Korean players she's trying to beat out for Rio won't be there! For those of you anxious to see her play, Brooke Henderson IS in the field. Also among other popular players who haven't played the LPGA a lot lately, Charley Hull, Cheyenne Woods, and Juli Inkster are there. And while some of the big names decided to postpone their seasons for another week, Michelle Wie and Stacy Lewis are not among them; both players will be in the Bahamas. I must admit I have trouble understanding why anybody would skip a week in the Bahamas, especially given the cold weather we're having here in the US. But hey, I guess that's what happens when you make a lot of money playing golf all over the world. The first round is live on GC at 11:30am ET Thursday. The ladies are back in action -- be there!